The British and drinking tea are two things that go hand-in-hand. Everyone knows that the English love a good cuppa, but most do not realize the extent of this. A good example of how important a cup of tea is to the British is the fact that the British government bought all the tea during WWII. This phenomenal purchase started in 1942, which was a tough year for the British. They had been defeated by the Axis powers on the continent and had been obliged to withdraw their troops from Europe. Their fortress of Singapore had fallen, and the country was close to being bankrupt. The government had to find a way to keep up troop morale, and the answer was black tea. This resulted in the very unusual decision of buying all the black tea available in Europe. So much tea was bought that it has been listed in the top five purchases of the war. It estimated that, based on weight alone, the British government bought more tea than it did artillery shells and explosives. 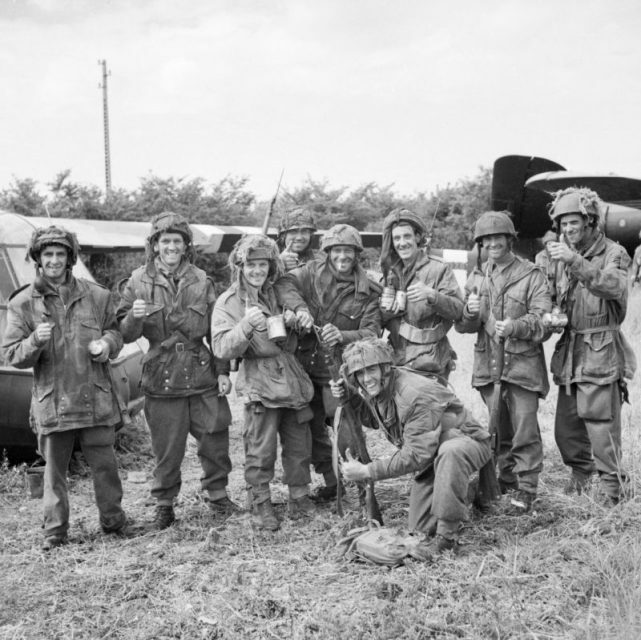 Members of 12th Parachute Battalion, 5th Parachute Brigade, 6th Airborne Division, enjoy a cup of tea after fighting their way back to their own lines after three days behind enemy lines in Normandy, June 10, 1944. There are some historians who believe that the vast amounts of tea were Britain’s secret weapon. Tea was seen as a very visible symbol of unity for the nation at war. It was something that everyone could appreciate. The troops could have something from home with them on the front while people still in the country could have something to calm themselves. 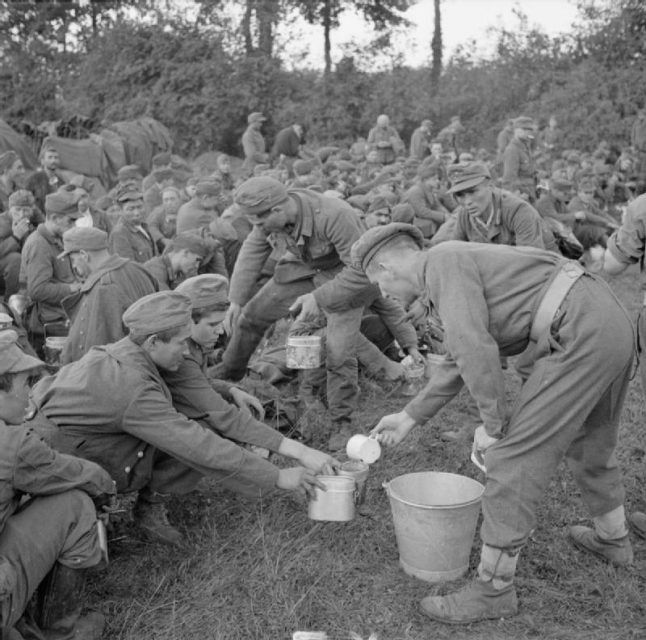 Tea on the front also ensured that the troops drank enough water to stay hydrated. The water that was sent to the troops was in old oil cans which left a strange aftertaste. The addition of tea masked this while energizing the men due to the caffeine content. The value of tea to the British was clearly illustrated when the Royal Air Force dropped 75,000 tea bombs into the occupied Netherlands. The bombs each had bags of tea from the Dutch East Indies and a message from the British about the Netherlands rising again. Packages sent to prisoners of war by the Red Cross also contained a packet of Twinings tea. However, the importance of tea for the troops was not something new to the British government or armed forces. There are reports that, in 1815, tea had been liberally distributed among British troops before the Battle of Waterloo. The purchase of tea during WWII was simply making this military tradition official. 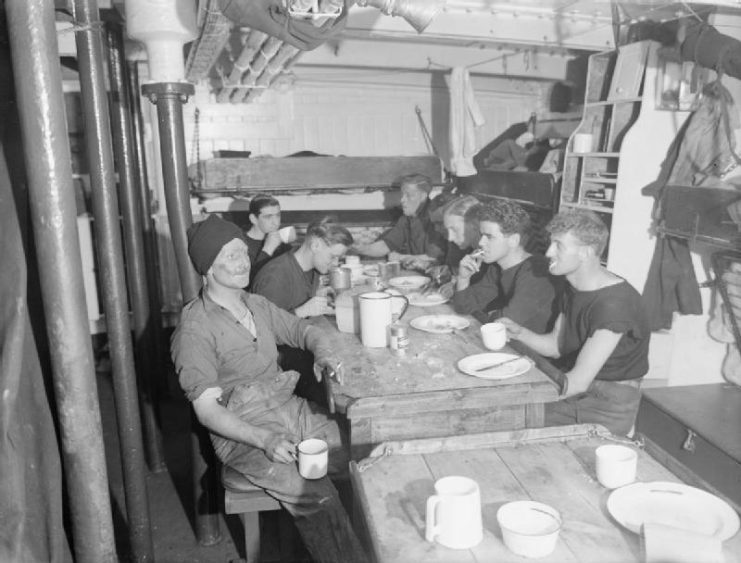 Tea time on Board HMT Stella Pegasi, 1942. 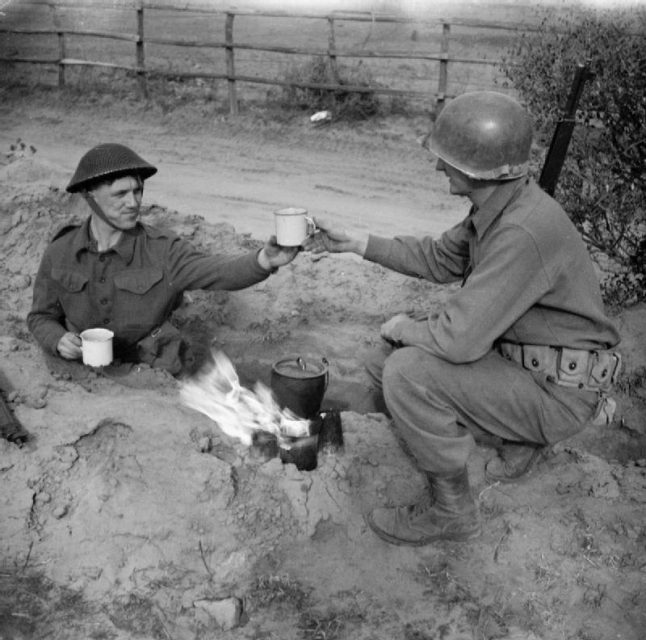 To ensure that they were able to drink their tea, the soldiers came up with ways to brew it. The Benghazi burner is a simplified brazier which was used during the North African campaigns of WWII. The stove was made from a four-gallon steel fuel can which had been pierced on the top to allow oxygen to enter. The base of the can would contain sand onto which gasoline was poured. The soldiers would stir the gasoline into the sand and then set it on fire. A second can would generally be placed on top of the burning one and used as a cooking vessel — or to brew tea. The primary advantages of this burner were that it was silent and fast. The easy availability of sand, empty cans, and gasoline meant that tea could be made at any time. However, this improvised cooker was not without its fault. The hot sand had been known to explode. The gasoline could also burn too quickly which made it unpredictable. Improvised tea-making facilities gave way to BVs or Boiling Vessels. These kettles have been a requirement in British armored fighting vehicles for the last 70 years. There is even an informal tradition of the junior member of a vehicle crew being the BV Commander in charge of providing hot drinks to everyone. While drinking tea is a British institution, there is another reason why this drink might have been shipped to the troops. 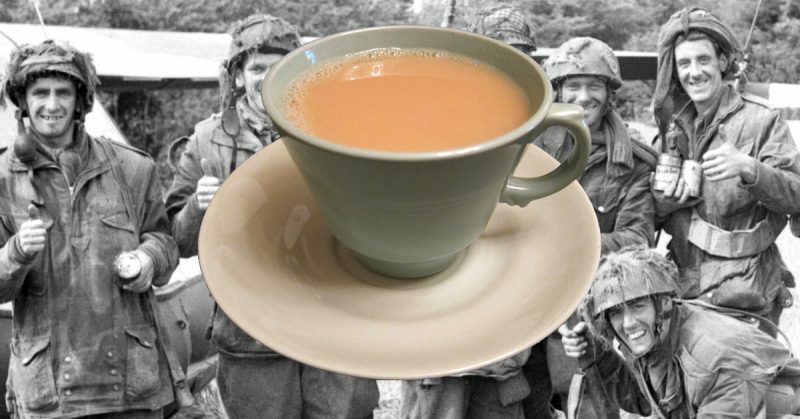 The supply of tea greatly reduced the use of alcohol among the soldiers. This ensured that the British fighters were always alert and sober while they waited for their next move. 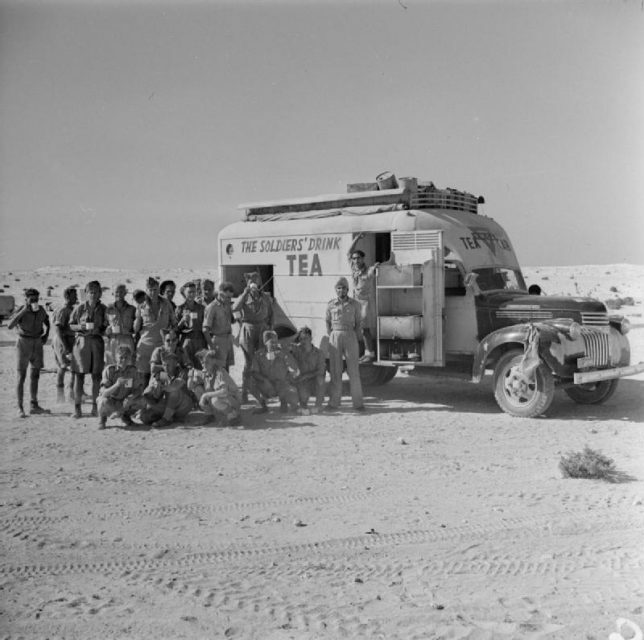 The British Army in North Africa 1942: a mobile tea canteen in the forward area, July 31, 1942. The tea the British government bought for the army was strong black tea from Ceylon, Assam, and Africa. East Asia was not a viable source as Chinese exports were close to zero and Japan was not seen as a preferred supplier. The taste of the tea can be characterized by the fact that many suspected bromide had been added to reduce passionate interests in the soldiers. Many soldiers also reported that, when lukewarm, the tea looked like an unskimmed pool. Supplying tea to the troops was a great way to boost morale on the front. Drinking tea was a social event which led to camaraderie and lifted everyone’s mood.